If you’re in need of flat roof repair in Newark, Ohio, or the surrounding area, then you’re in luck. E&E Construction is the leading commercial roof contractor for the state of Ohio, with more than a decade of experience repairing, restoring, and replacing industrial roofs. Our capable team specializes prompt, efficient, professional roof repair, making sure your flat or low-sloped roof stays leak free and high performing for years to come. Call us at (740) 331-0695 today for a free estimate. Standing water due to improper slope or clogged drain systems. Cracking, tearing, punctures, bubbling in the roof membrane due to constant exposure to the sun, fluctuating temperatures (expansion and contraction), heavy foot traffic, and improper installation, among other things. Premature aging due to inferior sealing and exposure. 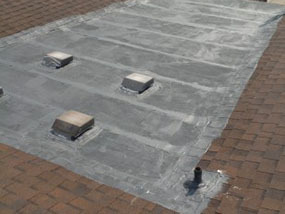 Flat roofs often require more diligent maintenance and care than other roofs. 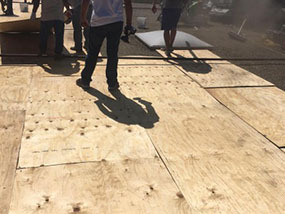 The experts at E&E are familiar with the unique challenges a flat roof can present and offer a full range of services to address any needs you may have. We can take care of issues and help you avoid future expenses with a thorough inspection. Call (740) 331-0695 today to learn more. E&E Construction prides itself on not only repairing your roof, but transforming it into a durable, energy saving asset. And when repairs are not enough, we also offer roof restoration. If your flat roof is looking old and tired and repairs seem to be more and more frequent, but you’re not excited about the idea of the mess and expense of a roof replacement, E&E offers a great alternative – roof restoration. Roof restoration is the process of applying a roof coating, also called liquid- or fluid-applied roofing, to your existing flat commercial roof to create a seamless, protective seal that can extend your roof’s life by several years or even decades. There are two main categories of seamless roof coating systems you can choose from: sprayed Polyurethane foam (SPF) and a selection of roof coating formulas that include silicone and acrylic. E&E Construction is the premier provider of flat roof repairs for residents of Ohio. Call (740) 331-0695 today for your free estimate and to discuss your commercial flat roof repair or restoration options.